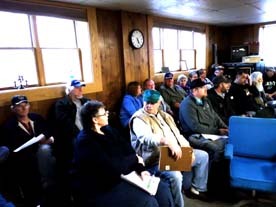 ZEBA — Representatives from the Bureau of Indian Affairs (BIA) and the Upper Peninsula Substance Enforcement Team (UPSET) presented information about how they work in the community to fight drug abuse to members and leaders of the Keweenaw Bay Indian Community (KBIC) on Thursday night at the Zeba Community Hall. “It takes a community to fight drugs,” said Detective Lieutenant Tim Sholander from UPSET. 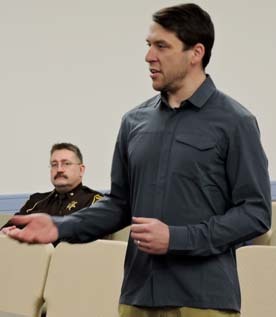 The presentation was focused on the factors that have contributed to the drug problems in Michigan, specifically methamphetamine, or meth, which is the drug found most often in Baraga County. According to Sholander and Special Agent Sarah Hill from BIA, crystal meth is trafficked into Michigan by Mexican cartels, and when it’s not, powdered meth is made locally in small batches. “Today when they make meth, it’s in a pop bottle,” Sholander said. The bottles are filled with a dangerous mixture of lithium, which ignites with moisture, and combustibles, often Coleman camp fuel, according to Sholander. The chemicals inside separate into layers, and are under pressure and can explode when disturbed, or even exposed to air. Sholander told the group that “cooks,” who make the meth, will usually peel the labels off the bottle to be able to monitor the mixture better. “Most of this hazardous material gets thrown out in the woods, left behind, or burned in the backyard,” Sholander said. If bottles like these are found, they shouldn’t be disturbed, but reported to the police. UPSET agents who are certified in handling the dangerous mixtures will come with special equipment to safely dispose of the bottles. Hill and Sholander also encouraged attendees to report any drug abuse, even if it’s a close relative or friend. UPSET officers aren’t trying to arrest everyone. “They don’t need jail all the time,” Sholander said. According to Sholander, their main targets for arrests are those profiting from the sale of drugs. For most users, they would prefer to intercede in other ways, encouraging reform or connecting them with help through rehab or intervention. Hill said it’s important to let those who are addicted know they are loved without enabling them. “To disown them, to abandon them, is the worst,” she said. People who want to make an anonymous tip to BIA can text 847411. Starting the message with “BIA” is necessary. The text generates an anonymous email to an agent who can then respond with questions without ever knowing where the text messages originate. To make an anonymous tip to UPSET, visit upsetdrugs.com. Sholander says to look out for needles, rubber tie-offs, burnt spoons or tinfoil. These are all signs of drug use. Freezer packs, fertilizer spikes, Sudafed and Claritin, drain cleaners, Coleman camp fuel and HEET are all consumer products that can be used in the manufacture of meth. People using meth often show rapid weight loss and scabs on the face. According to Sholander, people manufacturing meth will often have burns on their fingertips. “Don’t be afraid to call,” Sholander said.